Quarterly figures have been arriving thick and fast this week. We look at three key cinema companies: Regal Entertainment, Imax Corporation and Dolby Laboratories. The world’s largest cinema operator announced its quarterly figures and they were not what the analysts had hoped for, with revenue of USD $770.3 million, down 8.5% year-on-year and misses expectations by USD $41.41 million. There was a dividend of USD $0.22 per share. The CEO put a brave face on the drop and found a silver lining to highlight, though I’m not sure about her positive take on this year’s BO potential. In the earnings call that followed there was an acknowledgment of the harsher realities faced this summer but also some historical perspective by Ms Miles. Concessions, better consumer amenities, premium seats as well as Imax/RPX (premium large format) screens are the key to riding out the financial troughs. And finally, the early returns on our initial investments in luxury, reclining seats are very promising, and in most cases, ahead of our expectations. We have fully converted 5 locations with 46 screens and are on track to complete 25 locations with 275 screens by the end of the year. As a reminder, this concept is not right for every location. Many of our theaters are simply too busy to sustain the seat loss that results from the installation of the larger recliners. Other insights: average ticket price was up by USD $0.05, premium screens attract 17% of box office, operating expenses were down by 1% (“due primarily to decreases in attendance-driven theater-level cost and lower payments associated with premium format revenue”), New York City and Washington D.C. were down by more than the market average, while alcoholic beverage serving was up from 31 to 39 locations. Interestingly the company doesn’t think it is possible to cut staffing levels any more than they already have. For the premium large format operator earnings were up even though revenues were down in the second quarter of 2014 (same quarter as Regal and Dolby but different counting). The press release detailed. 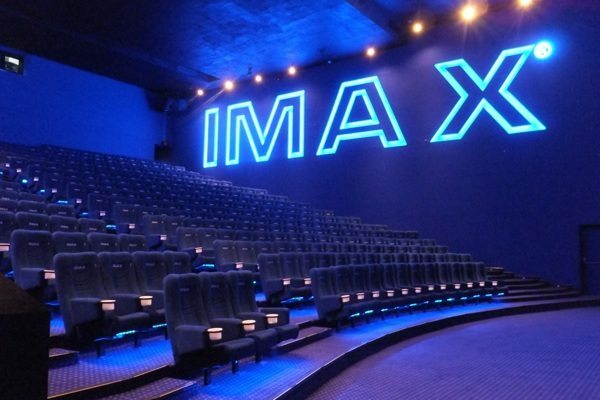 Imax today reported second quarter 2014 revenues of $79.1 million, adjusted EBITDA as calculated in accordance with the Company’s credit facility of $32.8 million, adjusted net income, after non-controlling interest, of $17.2 million, or $0.25 per diluted share, and reported net income, after non-controlling interest, of $13.3 million, or $0.19 per diluted share. China is now so important for Imax that it the market got its own (long) paragraph in the press release. No transcript of the earnings conference call, but the trades weighed in after listening to it. THR noted that unrest in Russia and Ukraine had not (yet) had an impact on the company’s business there. Variety meanwhile picked up on Imax’s overall expansion plans. Imax had 24 new theater signings and revenue share arrangements, ten fewer than the year ago period. Its network of theater chains now stands at 868, counting both commercial multiplexes and institutional theaters, up from 767 in the same quarter the previous year. Imax’s shares were down 2.3% on Wednesday at CAN $24.69. Year-over-year, other markets was down about 3% due to a onetime license fee for imaging technologies in Q3 of last year that didn’t repeat this year. Product and services revenue was $17.8 million in Q3, which was down $2.2 million sequentially from Q2 and down $4.6 million year-over-year, as we continue to work through the maturing phase of the digital equipment cycle that’s not fully offset yet by adoption of newer solutions, such as our Dolby Atmos.